The 1000FF Single-Mode to Multimode Fiber Converter supports Gigabit Ethernet. Capable of extending network distances up to 50 km (31 mi.) over single-mode fiber. Available with SC connectors in a variety of both multimode and single-mode fiber combinations. Supports 1000Base-Lx/Sx and IEEE 802.3 specifications. Wall-mountable or rack-mountable on a 5-unit shelf or in the 14 unit power-redundant FlexPoint Powered Chassis. The 1000FF product line supports the IEEE 802.3 standard and provides an extensive range of connectivity options across different media types. 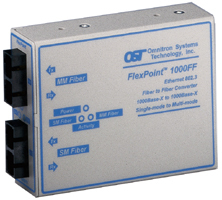 The 1000FF Single-Mode to Multimode Fiber Converter provides a cost-effective solution to extend network distances by connecting multimode fiber networks or devices over single-mode fiber cabling. The provides diagnostic data through LED indicators that assist in network installation and maintenance. The LEDs report the availability of power and the detection of devices attached to the fiber ports. The offers several mounting options. It can be mounted stand-alone utilizing optional wall-mounting hardware. It can also be rack-mounted using a 5-unit rack-mounting shelf or be installed in a rack-mountable, high-density, 14-unit, power-redundant chassis. For other power configurations, consult factory.